HBI’s approach to Home Remodeling draws upon a wide range of experiences and proven abilities, allowing us to approach even the most difficult remodel challenges with creativity and a vision that sees beyond obstacles. As the following project case studies illustrate, we’re not afraid of a challenge; in fact, you might even say we enjoy the opportunity to prove ourselves. 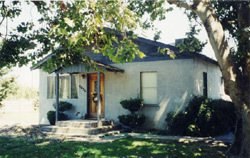 This two-story house was built in the 1920s as the parsonage of Emanuel Lutheran Church in Modesto. 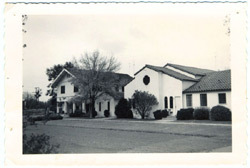 In 1999 the building, which had housed Sunday school classes and youth activities for 40 years, was scheduled for demolition to make way for modern facilities. HBI acquired the building from the church, saving it from the wrecking ball, and moved it down College Avenue to a new location, a process which required extensive interaction and negotiation with city officials. 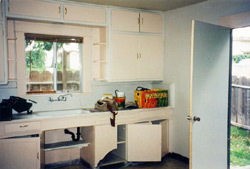 The house was set on a new foundation and the house was completely remodeled. While still maintaining the architectural aesthetic of the house, HBI gutted the interior, updating the electrical, plumbing, and other mechanical infrastructure. The result is a charming home that features the comforts of modern technology while celebrating the enduring character and ambience of home’s original design. Mouse over the picture to see the result. This circa 1920 farmhouse had suffered years of neglect and disrepair. Its country setting, however, made it an ideal location for a home, while the condition of the structure seemed to suggest demolition as the most viable approach. HBI assessed the condition of the structure, determining that the foundation and exterior walls were still sound, and then developed a design that would utilize as much of the existing structure as possible. HBI updated all of the mechanics of the structure, including a new well, all power and electrical, plumbing, central heating and air, etc, and completely remodeled the interior and exterior of the home. The result is a beautiful new home set in the midst of mature shade trees and flanked by the well-tended rows of an almond orchard. This home began as a 900 square foot farmhouse in which the owners had lived for 20 years. HBI was brought in to assist in the design and complete the remodel that would add 1500 square feet of living space and a two-car garage, all while the clients lived in the house. 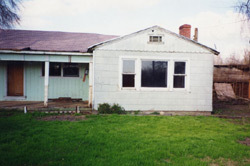 A victim of the Stanislaus County flood of 1955, this home was relocated and then used as a rental property for 40 years before being foreclosed and condemned. HBI acquired the building and completed a total remodel of the structure, transforming this formerly “non-livable” space into a charming and inviting home.